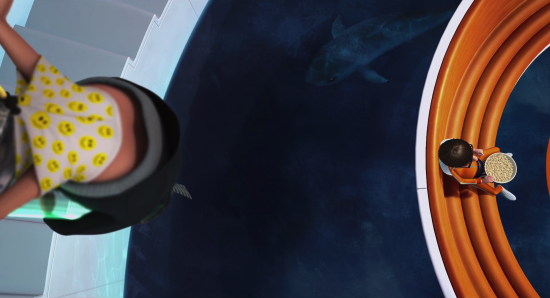 THE LAST THING WE SAW: We paused at 00:47:30, right in the middle of Gru’s so far questionably successful heist of the shrink ray from Vector’s lair, as he hangs over a shark and an ostensibly unaware Vector. Ben: I am so mad that we had to pause this brilliant scene mid-way! Phil: I know, it’s been great! 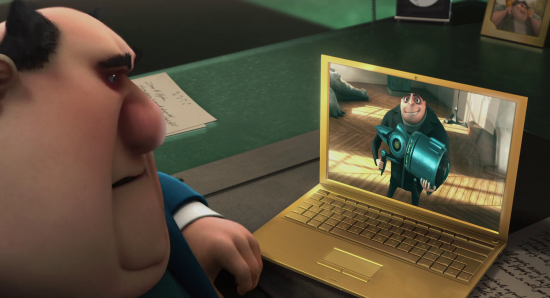 Gru has essentially locked himself in Vector’s compound (should have turned off autocomplete or whatever was steering those cookie-bots), and as such, he’s going to have a pretty ridiculous Keystone Cops time of trying to get out (e.g. the above screenshot). Just as he is walking out, Vector will smugly stop him and retrieve the shrink ray. 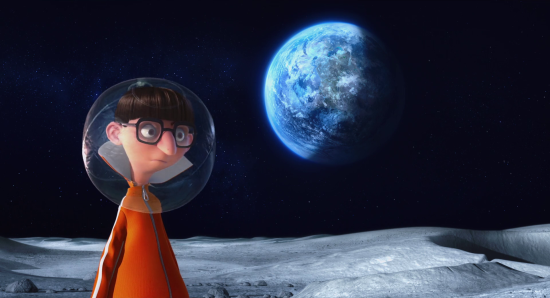 Ben: Gotta disagree; the only things that will shrink are the moon and my confidence in your predictions. 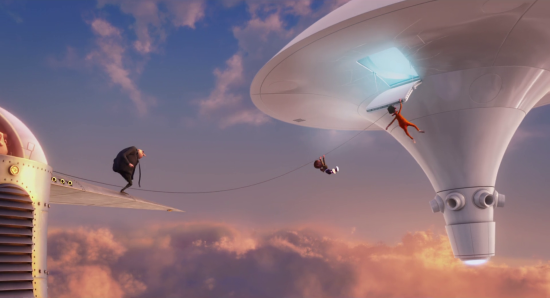 Gru will (barely) escape with the ray, and then it will be a race against time to secure funding and shrink/steal the moon before Vector can take the ray back. Phil: I can see why you thought that, because I initially thought this, too. Ben: So you agreed with me! I always knew you were smart. Ah, but what made you reconsider? 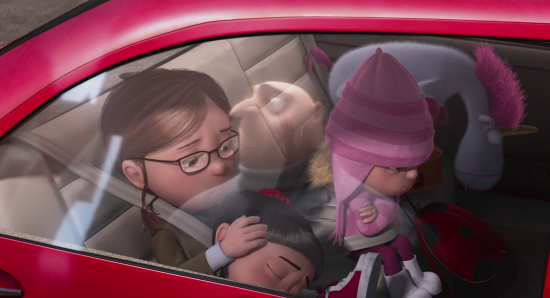 Phil: This story is going to be Gru’s slow appreciation for the girls and his role as their father, and he’ll discover that he’d rather be a parent than a villain. To further this plot, he’ll need a loss here to provide a bonding moment between him and the girls. 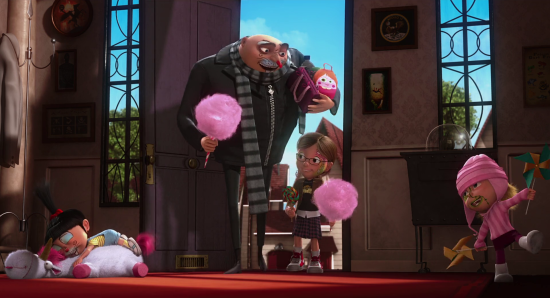 Ben: It’s funny to see him fail, but I want him to get away with the shrink ray, and here’s why: I want the rest of the plot to be Gru’s mission to shrink and steal the moon while simultaneously fighting off Vector’s attempts to take it back, and as all this is happening, he’s learning to love and raise these girls. That’s exciting to me! Phil: Well, wishing don’t make it so, pal! Anyway, while we disagree how well he’ll fare here, we both agree this will be an adventure with his three new daughters during which they’ll bond. Ben: During which they’ll become a family. 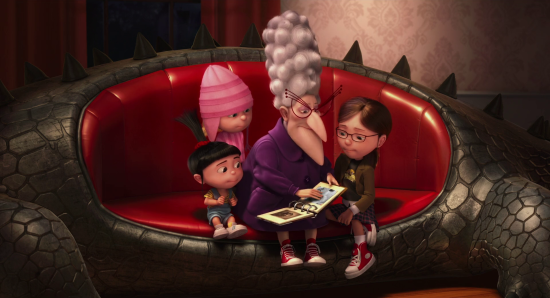 You can go on a camping trip and bond, but the misadventures will make them a family unit. Phil: Very true. Anyway, if he does fail here, he’ll go back to the car, and the girls will be all like, “Why the long nose—I mean face?” And he’ll be all vague as to what the problem is, but they’ll offer to help. Ben: Right, because they don’t know they’re on a secret mission. They think they’re just delivering cookies. Ben: But the oldest girl will feel that she has to prove that she can help. She is smart and capable, and she wants people to know that. Phil: Good thing they’re not making a whole movie about them. Anyway, through the girls’ help, he’ll appreciate them a lot more and realize he likes having them as daughters. Ben: And that they’re capable and can teach him. They’re the ones that know about love and family. They have more to teach him than he can teach them. Phil: Yes! And, in fact, becoming a loving parent and appreciating them will heal the wound that his mother’s upbringing has clearly left. It will patch up that part of him and his story. Ben: Right, they’re not only going to show him how to be a dad; they’re also going to show him how to be a son to his mom. Phil: In fact, this might even show his mother how to be a better parent. Ben: Well, anyway, whenever he does get the shrink ray, his next problem, sequentially, will be financing. He’ll have to go back to Will Arnett Devil Banker, who looks like Dionysus on a bad wine, to get money for the rocket to the moon. 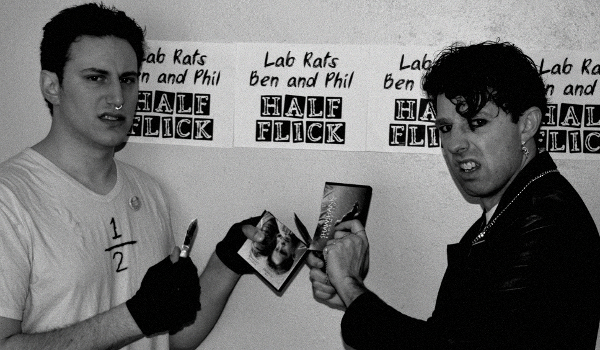 Phil: See, I think the hijinks will be less about the banker and more about trying to get the shrink ray with the girls. Ben: Ah! I kinda want to see that movie. Phil: Maybe you will, Lois! Maybe you will. Here’s what I think is going to happen: he’s going to spend a good chunk trying to get the ray with the girls. Phil: He’ll then reexamine everything and realize that his purpose to be a villain has been pointless, and that being a dad is far more fulfilling and interesting to him. Ben: See, I actually think he digs being a villain, and not just a villain, but a badass. The whole opening sequence expertly showcases that damn, it feels good to be a gangster. He wants to play by his own rules and no one else’s. He’s not just selfish, he’s actively evil toward others, even when it doesn’t benefit him. Case in point: when he pops that kid’s balloon, he gets nothing out of it, except the kid’s misery. Phil: I think the only reason he’s been evil is that he has been egged on and coerced by his mother to think that this is a good idea. Kind of like when a parent wants his kid to follow in the same profession, but the kid has completely different desires. And I disagree that he’s playing by nobody else’s rules—he is playing by his mom’s rules. Phil: He cares about about her opinion and wants to please her. However, through this journey, he’ll realize that his mother’s ideas aren’t working for him, and that he is finding true joy in this new pursuit, namely being a loving parent to these three girls. Ben: See, this really highlights what I think is a central theme: you have to generate your own sense of self-worth. At this point, he’s making the girls sleep in partially deactivated bombs and sending them on dangerous missions, but the pathetic unicorn toy substitute shows that he’s trying. He wants to be the best at everything he does, and he’ll want to be the best father figure, too. Phil: The other reason I don’t think he’s going to stay a villain at the end of the movie is that, since we both agree that the girls won’t be on board with this, he’ll have to choose between villainy and the daughters, and he’ll obviously choose them. Ben: Shoot. I really wanted him to keep being being evil, but yeah, you’re right. 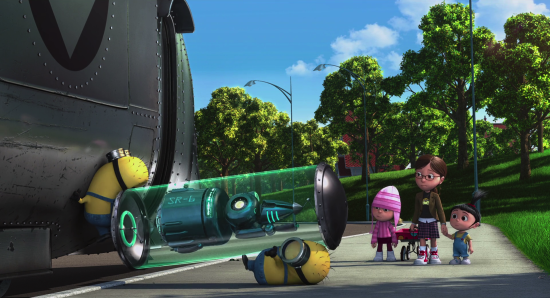 Ben: Yeah, and Vector will be all confused as to why Gru is giving up so easily. Phil: Oh! 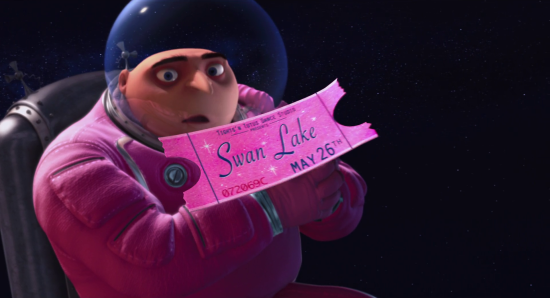 In fact, Gru won’t be giving the shrink ray up that easily. 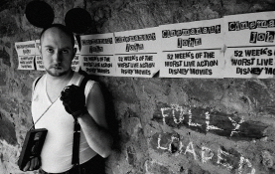 He will try to convince Vector that villainy is a pointless and meaningless pursuit. Ben: Not just that, but it’s the complete antithesis of anything worthwhile. It’s beyond pointless, it’s wrong and harmful. Ben: Actually, before we move on, I think it’s worth pointing out that the oldest girl will try to convince them with all sorts of, “Hey! If you steal the moon, the tides will no longer exist! Eighty species of jellyfish will die! The coasts will be all messed up!” Shrinking the moon would be a tragically myopic victory. Phil: Pyrrhus would be proud. 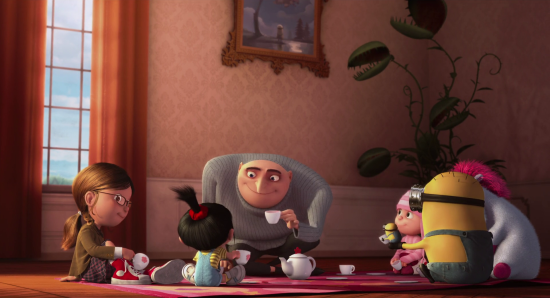 Anyway, at this point Vector and Gru will have a physical fight, through which Gru will convince Vector that villainy is not worthwhile and that there are more fulfilling ways to spend one’s life. 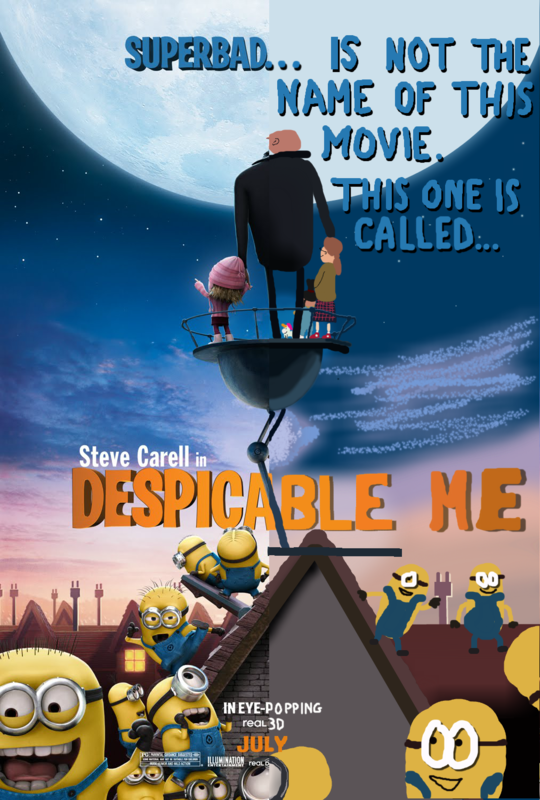 Vector and Gru will even become buds. Ben: I don’t think they’ll become buds—in fact, I don’t think Vector will be convinced. 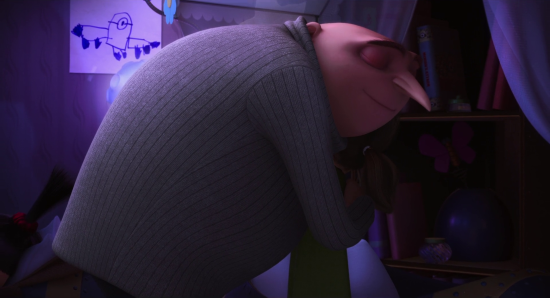 Gru will more likely use the shrink ray on Vector and put him in a jar. 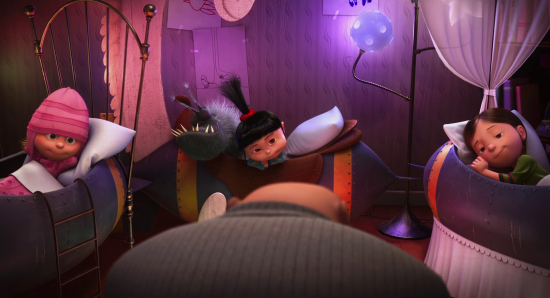 Phil: I think there’ll be a lot of shrinking going on during the fight, but Vector will come around to see Gru’s points. Oooo, here’s a thought: what if, during their struggle, they both accidentally shrink Earth or something, and then have to work together to fix the problem? Ben: I like it better when they hate each other. Also, dude, there are sequels. Phil: Also, dude, they have to fix it. Together. Ben: Ugh. It would be sooo boring if they liked each other and got along. Cinemanaut John watches Prom, a movie he wishes had an exclamation point in the title.